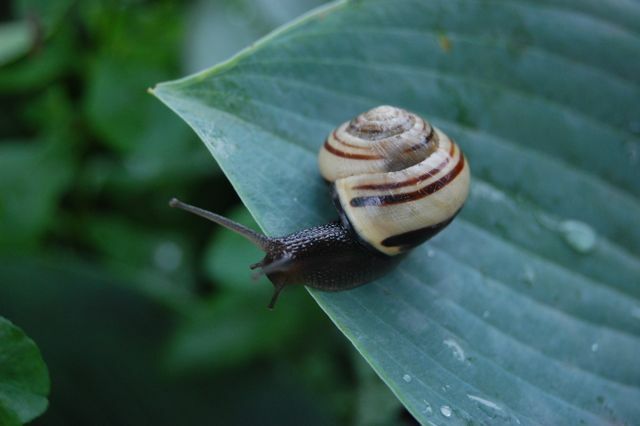 The snail population in my garden took a spike about fifteen years ago when our daughter adopted one and gave it a home on a punky log I’d been thinking was an ornament (add air quotes) in my front garden. It was, like all snails, of two-for-one gender. I think she named it Snaily. Many intervening years and much mulch have created sort of a holiday home for Snaily and his/her crew. The cool wet weather prior to this week of Sudden Summer must have made them particularly frisky. 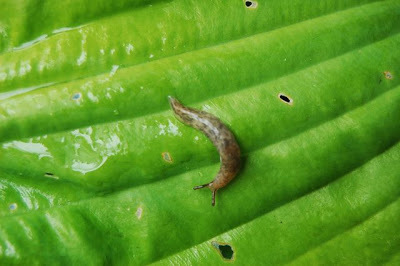 Likewise, their cousins the slugs. Both are currently chewing holes in the hostas and leaving irridescent slime trails on the paving. I don’t advocate the wholesale extinction of slugs and snails (which, after all, along with puppydog tails, are what little boys are made of… and where would we be without them?). Googling “slug benefits” just for fun surfaced this post for young naturalists [Update: the link is no longer active], pointing out that these slimy guys play an important role in decomposition of… well, things that need decomposing. However, I do unceremoniously remove those I find on my foliage. My approved method of molluscular control (don’t bother looking up molluscular, of any of the other words I make up for my own convenience) is similar to my approved bug control technique. Instead of squishing, however, I flick and fling. After one, brief, airborne moment, there’s always the chance that Snaily will land on his/her foot (s/he only has one) and be back for more. Holiday home, indeed! And they bring their own caravans. Helen, you are more charitable than I. Snails I ignore because there are fewer. But slugs I snip with my Felcos. No flipping here. "Flick and fling" – thanks for the laugh!